Good morning friends! I’m blogging today to make up for not blogging yesterday, as I knew I wouldn’t. Yesterday was candy cane cookie day, so I went up to my parents’ place and hung out with my family and made loads of delicious cookies instead of blogging. I had meant to blog on Wednesday, but that didn’t happen, in favor of Christmas cards. So many Christmasy things happening this week! Well, that’s what happens when you’re only a week away and trying to cram in all the things. So here we are, blogging on a Friday, catching up with what we did last week. I made my husband help me pull out all the Christmas decorations. I felt only a little bad, because he’s not really into the whole Christmas thing, but we are trying to establish family traditions for when the boys get here, so I didn’t feel too bad about it. I would have liked to have to tree up sooner, but he made me promise not until December proper, and then it was a matter of finding the time to do it. We finally managed it last Saturday and I’ve been enjoying my Christmas decorations all week. Christmas is the only holiday I really decorate for. I’d like to do more for other holidays, but that requires accumulating decorations for other holidays, and storing said decorations, and remembering to switch them all out at the appropriate time. I got Easter eggs last year, but never got the grass to fill the bowl with so I could use them. They’re still around here somewhere. Christmas is a little easier, since it has it’s own built in decorating traditions that don’t require any creativity on my part. Mainly, the tree and stockings. When I was a kid we had big stockings that my parents would fill with little gifts and lots of candy. We didn’t have a fire place, though, so we just hung them on the hutch and called it a day. I don’t remember if we opened them before or after presents, but they were always there, until they weren’t. I also don’t remember when we gave up on the stocking tradition. There wasn’t a place to hang them in the new house when we moved. Sure the hutch came with us, but it was in the kitchen and not the living room now, so it seemed a little weird to put them there. I guess we just sort of out grew the whole thing at some point without noticing. There was candy around anyway, so it wasn’t a big deal. I was so excited when Logan and I moved into a house with a proper fire place. We don’t use it a whole lot, but it looks nice and I always wanted one. I was especially excited when our first Christmas here came and it occurred to me that we had a proper place for stockings. I wasn’t going to get us huge ones, or anything. I never planned to fill them, just hang them up so they looked nice. I got ones with our first initials on them and it pleases me to no end that his L is on the left and my R is on the right. This year, while black Friday shopping, I couldn’t resist picking up two more stockings. I know I shouldn’t have, since names aren’t set in stone until they’re written on a birth certificate, and sometimes not even then, but I saw them and I couldn’t resist. We have names picked out for our boys. I won’t share them here, though many know them already. It just seems wrong to put them out there publicly before they’re completely set. But I will say that we are pretty confident in them, enough so that I felt okay buying them stockings. 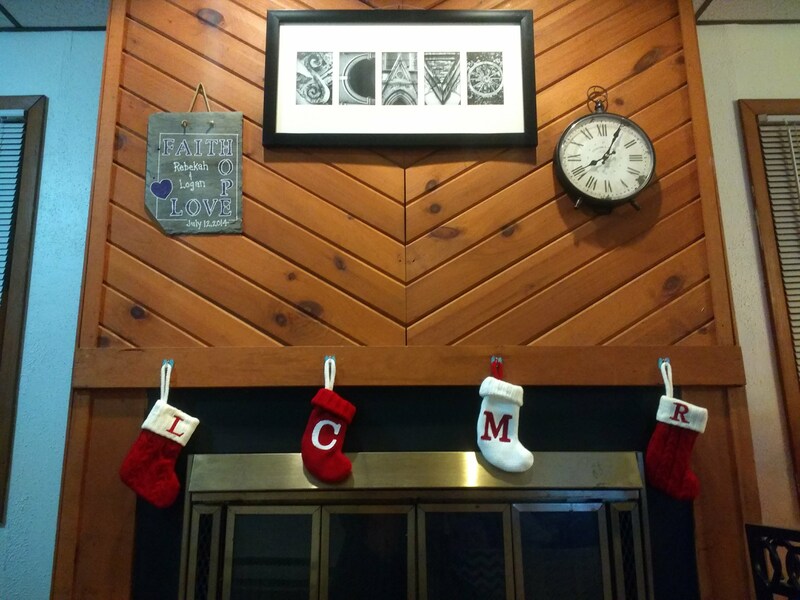 I don’t know if we’ll do the whole stocking tradition, but the decoration, and the option will be there. I was very relieved, when I pulled out our stockings, to find that they didn’t match the boys. I was concerned, having bought the boys color coordinating stockings that one of them would match ours and then the other would be the odd man out. Luckily neither of them match so they can be their own thing all together. I have a few years to figure out what to do when number 3 comes along. Hanging the stockings has been an interesting challenge this year. I could have put nails in the wooden frame, but then they’d have to be pulled out or left there all year. I feel like it’s not a great idea to have random nails sticking out if you don’t have to, so I opted to not do that. Last year I used clear command strip hooks, which worked really well. The problem this year is I was out of the sticky strips to hold them on. I had meant to look for more at Target the last time I was there, but I forgot, twice, and of course remembered only when I went to look for them. I had all the hooks, but no way to hang them. Logan told me to just use sticky tack. I inherited an unwanted mass of sticky tack when I graduated and had to clean out an entire apartment with only my then fiance to help me. This blue ball has served me well for attaching cards and things to the walls every year since. The problem is, it’s blue and the hooks are clear. So naturally you can see the sticky tack behind the hooks. I feel like it looks a little weird, but Logan said he wouldn’t think anything of it if he saw it, and I figured few enough people would be in our house to see it, so if it didn’t bother us, it wasn’t a big deal. Sticky tack it is, then, that holds our stockings up this year. It’s working well, thus far. 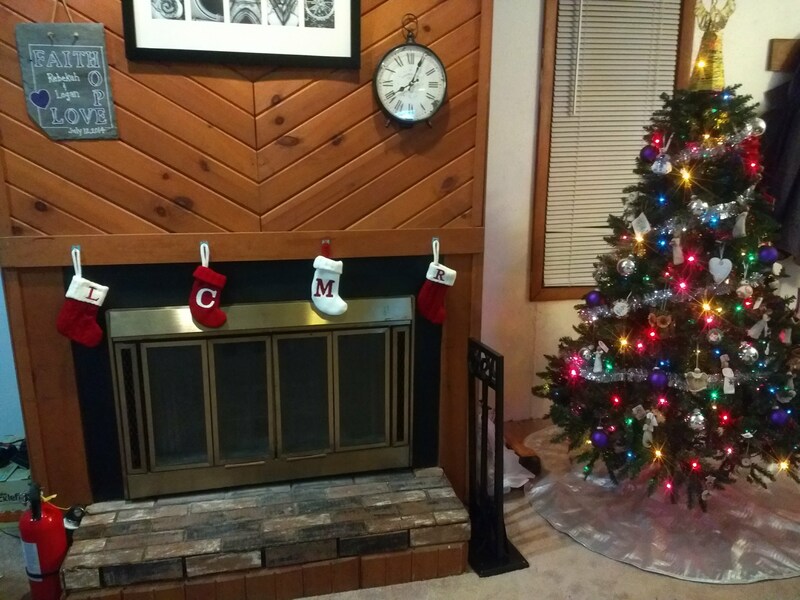 So now that we have our stockings hung and our tree up and everything is festive, I just need to start wrapping presents, and finish up Christmas Cards, and Christmas shopping. I still have a lot to do. I’m considering doing some actual baking this year. I finally gathered my dad’s cookie recipes and I think I might attempt some snow ball cookies as well as the mint chip cookies I did last year, provided I can find the recipe for them. And I find time to actually bake. We’ll see how this goes. I’ve got a whole week left, so wish me luck! Have a lovely day, my friends.